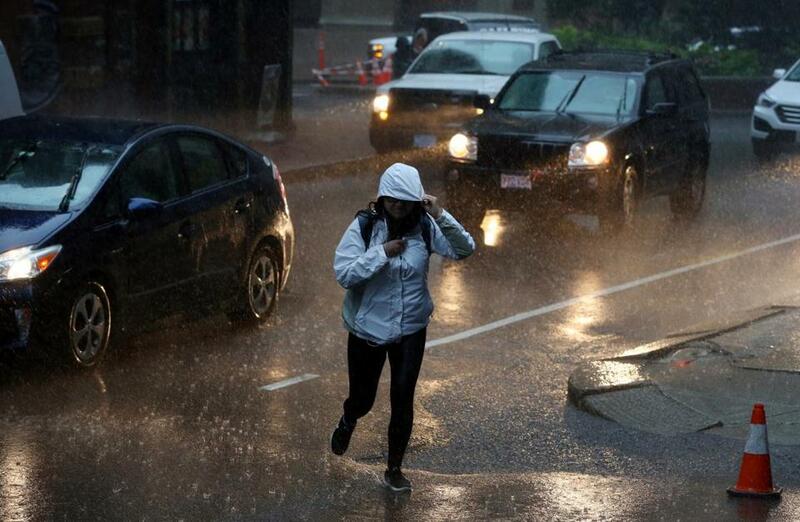 A pedestrian navigated Kilby Street during heavy rain in downtown Boston. Raindrops keep falling on our heads. And the trend will continue Friday night with a storm bringing moderate to heavy rains and potential flooding. Clear skies but strong winds will follow on Saturday, forecasters say. The National Weather Service says a “potent storm system continues to be on track to impact Southern New England” Friday evening and overnight. 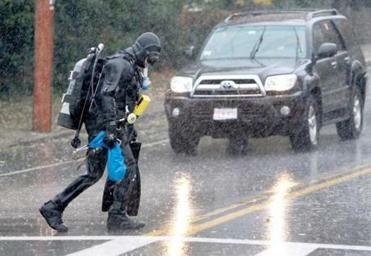 The storm could dump 1 to 2 inches of rain in a short period of time. More — possibly 3 inches — could fall in some areas, particularly over southeastern portions of the region. Some thunderstorms are even possible. The forecasters have issued a flood watch for all of Southern New England, except the islands. Flooding may occur in urban and poor drainage areas, as well as some rivers and streams. The flood watch continues into Saturday morning even as the rain ends, because the runoff will continue to work its way into small streams and rivers. Take a look at the storm drains on your street and make sure they’re clear of any leaves because clogged drains will only make flooding worse. If you think we’ve seen a lot of rain lately, you’re absolutely right. Accuweather.com’s Minutecast product projected that rain will begin in Boston shortly before 6 p.m. Friday. After the rain will come the wind. Forecasters issued wind advisories for Central and Eastern Massachusetts, as well as the Cape and islands, warning of westerly winds ramping up Saturday to 15 to 25 miles per hour, with gusts up to 50 miles per hour. “Not all trees have lost their leaves, so there is an expectation this would enhance the potential for tree damage and power outages ,” the forecasters said. The rest of the weekend will shape up to be sunny and dry. Saturday will be mostly cloudy in the morning, and then clearing, with highs in the upper 40s. It will get colder in the afternoon as winds pick up and temperatures fall into the lower 40s, forecasters said. Saturday night will be mostly clear and chilly in the Boston area, with lows dipping to the middle 20s and lower 30s. Sunday will be sunny, with highs in the 40s, and temperatures are expect to plunge into the 20s at night. Monday will be mostly sunny during the day, with highs in the mid 40s. Another round of rainfall is due to arrive Monday night, and it could be heavy at times. Even better yet, there’s a chance it could start as snow in the interior of the state. One to two inches of rain is possible. Dry but unseasonably cold weather will return Wednesday into Thursday, the weather service said. Martin Finucane can be reached at martin.finucane@globe.com. Emily Sweeney can be reached atesweeney@globe.com. Follow her on Twitter @emilysweeney.